This chapter is traditional for my articles. In this final chapter I am trying to fill all gaps of my previous narrative and explain how everything actually was. To begin with, quite recently (in geological terms) in place of the Nazca there was the sea. I am convinced in this not only because I saw sand and gravel deposits that cover Nazca, but also because I saw a cross-section in the outcrops on the slopes of the right bank of the valley of the Nazca river near the place called Agua Salada (Salt Water), in the western part of the desert. Here I found thin lentils of quaternary shell deposits and layers of iron nodules covered with shells of Balanus in life position. Balanus are barnacles that build their shells on the inshore on the fixed parts of the sea floor or on the rocks. Their presence testified that the sediments originated in shallow waters. Good preservation of their shells and weak cementation, that caused the presence of many rock fragments scattered around, testified about their young age. However, their position not on the sand surface, but within the geological section, far from the sea, did not allow to claim that it happened just recently. The age of such deposits could be both five and one hundred thousand years. Nevertheless, this marine period ended because the growth of the Andes started and the territory of Paleo-Nazca, that happened to be on the east wing of this mountain system, gradually began to rise and get drained. Several thousand years ago in the place of modern Nazca a very smooth, almost horizontal surface of the former seabed was uncovered. It was similar to that which we can observe on marine unwaterings. During low tides the water sometimes goes away for miles. The evenness of such areas is due to the fact that loose sediments are easily washed away and leveled by waves. So, as long as the sea periodically washes these areas, the relief remains very flat, even in spite of the process of mountain building. Waves cut growing hills and ridges until massive rock comes out to the surface, which is more difficult to deal with, and then some strange benches and rocks appear. So, the coastline moved away, but it was much closer than the modern coastline is. The block of Nazca (its front is marked with red lines in Figure 3) pressed from the east with its blunt-pointed nose against the underlying rocks, rose up a bit and covered them. 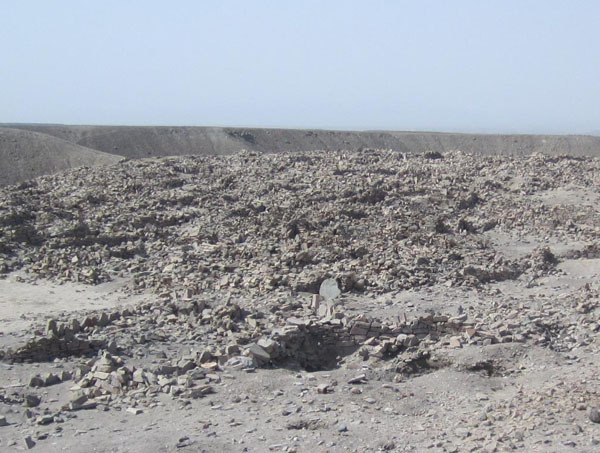 At the initial stage of drying the sea used to fill the intermountain depression between Nazca and the growing range of mountains on the west. It penetrated deep into the land from the north-west, from the side of Ica, and on the south (Figure 3). And if in the north the sea was behind two ridges of the mountains on the right bank of the Rio-Grande and the Rio Santa Cruz and was not easy to reach, then, on the contrary, on the south, from the side of Cahuachi, the access to the sea was open. Perhaps, this closeness determined the abundance of the drawings of marine animals, especially in the southern part of Nazca. In remembrance of those times on the desert surface there are some remains of whales that have not turned into dust yet. One of them is not far from Ica and is located at a height of about 500 m, the other one is in the area of the mouth of the Acari river at a height of about 70 m.
Figure 1. Fragment of the photo from Panoramio № 55003372. Figure 2. Fragment of the photo from Panoramio № 7892885. In my geological practice I found repeatedly such things in the Arctic, and I think they are not the result of erosion upon ancient skeletons from the underlying strata of deposits. They are deposits themselves that remained on the surface of the sea floor shortly before draining. Their age is unlikely to exceed a few thousand years, because the bones of large animals like whales, mammoths, or walruses are very fragile and get easily destroyed in the air. But let us go back to Figure 3. Sites that are painted brown present elevated areas. In the early stages of drying of Nazca they could represent islands that only later got connected together. In satellite photos the areas that only recently came out of the sea are distinguished by a gray color, while ancient land looks more brown. It is interesting that the archeologists do not find traces of ancient settlements along the modern coast. This seems odd, given that in the heyday of the Nazcan culture (first millennium AD) thousands of people lived here. It is not clear why they did not want to live near the sea filled with fish and mollusks. There can be several reasons for this paradox. One of them is that the coastline acquired the present position only recently. In the past it was seaward. Then there were settlements, which once got caught in the zone of sinking in the process of the reorganization of the relief and went under water. This is very likely, because it is here, from Nazca, the underwater lifting starts stretching for 5,000 km and ending with Easter Island, the problem of inhabiting of which so much interested Thor Heyerdahl. Prior to the reorganization of the relief this lifting, most likely, was above thesurface of water. This way, people moving to the east and crossing the sea channels ended up in this godforsaken place in the middle of the Pacific Ocean. Another reason for the lack of settlements along the coast could be that there were problems with fresh water. This idea is indirectly confirmed by the absence of lines and wedges here. Figure 3. Map of the Nazca-Ica region. Brown indecates areas of ancient land. Blue indicates the ancient sea. Red lines indicate the frontal part the Nazca block. Red dots indicate the remains of whales. During the period immediately before the draining, paleo-Nazca represented well freshened shallow bay, on the bottom of which there were lot of springs that used to bring carbonate and clay from the depths to the surface. It is from that period that some bright spots are left in places of groundwater outflow. After the water was gone, almost perfectly flat horizontal plain got exposed. It was covered with usual coastal marine sediments: sands and gravels. On the east, it bordered a low lifting covered with small hills and cut by depressions. Later some of them would turn into large modern river valleys: Santa Cruz, Rio Grande, Palpa, Viscas, and Nazca. But then these places represented wetlands overgrown with reeds, willow thickets, and acacia. They were filled with all kinds of living creatures, the drawings of which we can see now on the desert. After rains in the Andes, water sprimgs began to function here. Then on the surface of the plains wet spots appeared that slowly stretched in the direction of the flow. After some time, the surface of Nazca got covered with water sparkling in the sun. The water stood in puddles or slowly dripped down along slight lowerings in the surrounding depressions. The plain was not very high above sea level yet, hence, the groundwater was not far. This, in turn, hindered going of water into the sand and let this abundance of water exist for quite a long time. However, there were some parts of the plain that did not get overflooded by water. These were the arches of small anticlines, designated in the process of the beginning of tectonic activity. Naturally, people noticed them for agricultural purposes in the first place. Besides the fact that these areas were not overflowed with water, they were covered with sand, which was easy to cultivate and presented acceptable soil for plants. This distinguishes them from the slopes of mountains or valleys covered with rubble and clays. Equally important was the fact that these areas were relatively easy to irrigate. Water was near, it was only necessary to organize its constant supply to the field, because it did not stay long in sandy soils. People began to create natural irrigation systems of water supply and organize controlled irrigation. 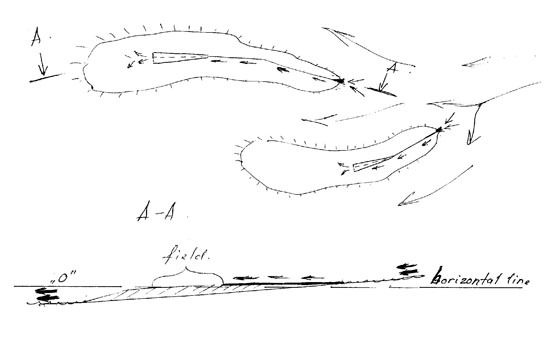 If the relief allowed ditches were laid from overwatered places, through which water automatically flew to the areas intended for irrigation. Naturally, they should not be exposed to excessive watering and there had to be an easy way to get rid of excess moisture. The excess of water as well as its lack is harmful to most plants. In the absence of the organic component in the sands the process of growing of plants was similar to hydroponics. All the nutrients got to the plants with water, the sand was only a substrate for the root system. Perhaps this is why the cob size of ancient corn, the cores of which are abundant in the vicinity of ancient tombs that got excavated, was only 5-6 cm long and 1-2 cm thick. Figure 4. Typical diagram of water intake on partially flooded areas. Arrows show the direction of water movement. Typically elongated shape of the geoglyphs was determined by the ridge character of the relief, which, in turn, was created by tectonics. In fact, it was a peculiar formation on the surface of folding. Depending on the form of such small islands various types of geoglyphs were used. Most widespread were the systems: a line-wedge and a wedge without a line. Zigzag systems that were made on very even elevations were widely used as well. Spirals were used much less. They were made on small horizontal sites. 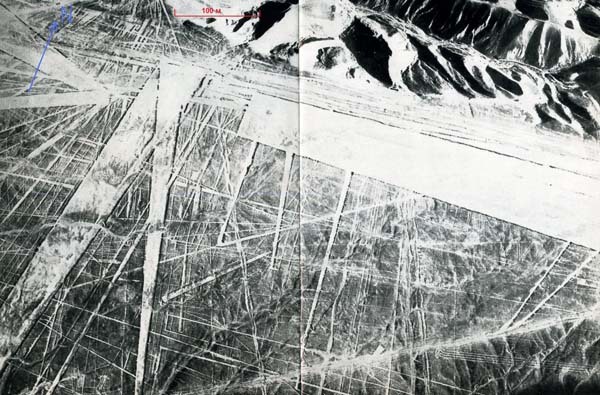 However, the most popular geoglyphs on the whole territory of Nazca were simple lines cutting it in many different directions. Apparently they performed exploratory function and assessed the presence of water and the direction of its flow. Considering the position of the geoglyphs on the geomorphological level, it can be noted that wedges and lines tended to concentrate at the borders between mountains and plains or between plains and depressions. This is due to both deep structural features of these transition zone, and the presence of vast inclined surfaces where the flow of water took place. Such is the area between the Nazca desert and the Ingenio river valley (the northern part of the desert) with the greatest concentration of geoglyphs. Now it is significantly cut by smaller depressions, but before there was a a gentle slope on which future structures were barely visible. It was through such places that water was drained from the plains into the lowerings that framed it, which the ancient people used to irrigate their fields. The vast majority of small wedges here were made with a sharp end up. Their position on the slope excluded the possibility of overwatering. These, I think, were the very first fields. A similar situation, but on a smaller scale, can be observed near the southern edge of the desert. There water was flowing into a just forming valley of the future Nazca river. There are wedges in the central parts of the desert as well, because there were depression and ledges too. But they are much less numerous there. So, it was in this unique setting combining the sun, heat, sand, plain and artesian springs, that people lived and cultivated their fields in this region in ancient times. However, the need to protect the fields from the excess water was not the only problem that people had to deal with. The era of tectonic activity was beginning on the Earth and its consequences were far more unpleasant for the inhabitants of Nazca. The earthquakes that probably accompanied these processes were not the greatest evil for the ancient inhabitants of Nazca. Warm climate did not require building fundamental structures, therefore, there was no threat that they would collapse. There was a different trouble. Tectonic shiftings led to the deformation of the surface and the change in the direction of water flows. Plains − micro-platforms − were especially sensitive to them. Lifting or lowering of any of their parts could change the direction of water flow over the entire surface. As a result, lines and wedges created with lots of hard work stopped functioning. Water did not flow through them onto the fields, the direction of the flow changed, and everything had to be done all over again. Thus, all those hundreds of randomly arranged lines appeared. 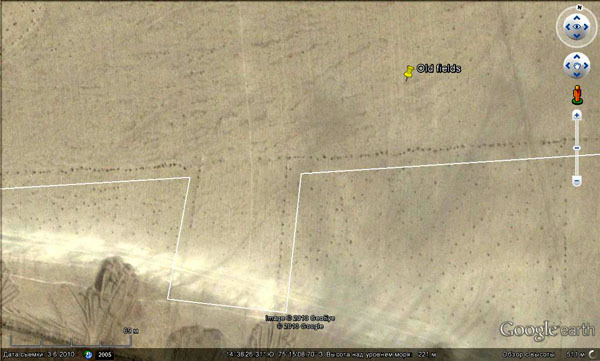 In Figure 5 we can see lots of geometric geoglyphs often cutting and overlapping each other. Figure 5. Northern corner of Nazca (approximate coordinates of the center are 14º41'12, 18” S and 75º06'54,62” W). Photo from the books written by Maria Reiche “Mystery on the desert”. Red interval shows approximate scale. Blue arrow shows the direction to the north. 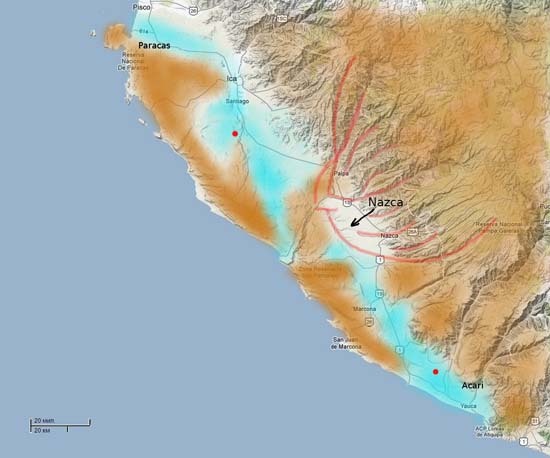 Figure 5 presents the edge of the Nazca plateau. In the past this was the area of bending mentioned above (the edge of the shoulder) where the water was running off into the depression framing the plain. At different periods its surface sloped towards the Ingenio valley, inside the plateau, and towards the ocean. The stretching of lines and the directions of the expansion of wedges confirms this. Another example of how the angle of plain’s sloping changed is shown in Figure 6. Arrows show the geoglyphs which simultaneously changed the angle of their striking. Now they are on a 100-m plateau, but previously they were on the same plain. Many people are surprised by the perfection of forms of geoglyphs. Some even insist on the supernatural nature of their origin. In fact, this was caused by ideal surface, on which they were created. Smooth surface provokes smooth lines that are easy to create using directing marks. And, on the contrary, uneven surface causes divergence. That is why there is less perfection in lines and wedges in the mountainous areas in small valleys. How long did this kind of live last? When did people start making lines? When did they finish? It is all unclear. So far, I do not know how to date them. Neither do I know what was the connection of lines and the creators of famous Nazca ceramics. The burials of this period are extremely widespread in the region, and except for postcolumbian graves, there are no traces of other cultures. However, I think, this period ended quite dramaticly. The moment came when growing tectonic stresses in this region exceeded the stability of geological strata. Mountain-buiding processes accelerated dramatically. Activation periods took place one after another. In front of people mountains grew, plains got covered with hills and cut by valleys, the coastline changed, gulfs and bays were drained. The fact that this process went with intervals is proven by the nature of traces left by the departing sea. Series of coastlines are preserved here and there. They stretch for miles, and they are visible due to the scattering of sand along the shore. Broad bands of wave-cut areas are preserved as well. Neither one nor the other can be formed overnight. It takes time, which means that between the periods of activation there were periods of rest. The restructuring of the relief, most likely, was accompanied by very strong earthquakes, and there is simply nothing we could compared with that. As a result of such eathquake shocks the buildings made of stone monoliths did not just fall apart, but often flew into separate blocks, as it was in Tiwanaku, Puma Punku, Ollantaytambo and Machu Picchu. In the region of Nazca itself, earthquakes ruined small ancient settlements near Palpa: Pinchango Alto and Santa Rosa. Look at Figure 7. Imagine how strong the shocks had to be in order to turn low stone walls into piles of rubble, that now we can barely guess the original settlement plan? The same tectonic movements lifted Pinchango Alto by hundred of meters up and surrounded it by inaccessible gaps and steep slopes. Therefore, the current location of some of these settlements that are hard to reach make historians mistakenly believe that they were made either for defense or for sacred purposes. (Remember the position of Machu Picchu). Figure 7. Ruins of Pinchango Alto. In the background one can see the surface of the northern plateau in the valley of Palpa. Cahuachi was also subjected to severely damages caused by final earthquakes. Thick clay walls with buttresses were broken in many places or demolished altogether. Their fragments often bear the traces of water erosion creating a difficult puzzle for archaeologists, who do not think about possible presence of artesian water here in the past and do not allow a fundamentally different, not religious, purpose of these facilities. Some of the most creative researchers have even attributed these destructions to the pilgrims who having lost faith in the power of their gods, that had left them out in the cold in the hungry hour, began to destroy this Vatican of South America. It was during this period, I think, that a part of the ocean − Lake Titicaca − was lifted to a height of more than 3 kilometers. Until now, this lake, despite the influx of fresh water, has the remains of the oceanic fauna. During the same time other intermountain depressions rose, including the one where Cuzco is located. Responses to these events are scattered in the myths of different nations around the world. I think that “Clash of the Titans” and “swaying sky” have a direct connection to this. Maximum efflux of waters, which resulted in forming numerous washouts that spoiled geoglyphs, could happen in the most active growth phase of the mountains when lifting led to quick drainage of water located on the way to the water discharge area out of the system of underground cavities and channels. Increasing of the angle of inclination led to their dramatic emptying, that caused the last flood on the plain. What happened with the Nazca region after the reorganization of the relief? The main thing was that the influx of artesian water was sharply reduced and the region began to turn into a desert. Most of the underground channels got blocked. Those that survived were not able to provide large inflow and water pressure. It was not enough to ensure the water flow from the hilltops and to nourish terraces located on the slopes or to supply water to the system of lines radiating from Centerpoints. At the most, there were small springs in the valleys and unnoticible bottom feeding of loose sediments filling them. This even caused swamps in some places. And only occasionally, where by some miracle underground water pipe was not broken, waters have good flow and quickly reacts to the inflow. Such situation is observed around Cerro Blanco, from which the system of puquios or aqueducts is being fed through the intermediate collector until now. It is hard to say how quickly it all happened. Most likely, there were several stages, with each of which the situation went from bad to worse. There was a period when people started actively building dams for the collection and preservation of water. We can observe them in small valleys on the left bank of the Rio Grande, two kilometers upstream of the similarly-named village. In the valley, at the rear of which the ruins of the ancient town of Santa Rosa are found there more than 5 dams. They are 120-130 m long, and they block it from side to side several times. There are dams in other dry tributaries upstream of the Rio Grande. On the way to the town called Pinchango Alto we ran into the remains of some very small dams blocking a steep valley going up. Each of the dams could hardly accumulate more than a few cubic meters of water. Now all the dams are broken, but the fact of their existence means that the transition period really was, and water did not end at once. Another evidence is an attempt to “get” it in Cahuachi. We will discuss this in the appendix devoted to these constructions. The water situation is worsening in the region even now and it is unlikely that this tendency is going to change for the better in the foreseeable future. So, to summarize this section, we are going to recall some major changes that occurred in this region in the process of restructuring. 1. Nazca plateau, which used to be at the level close to “0”, has risen to several hundred meters up and acquired a distinct inclination towards the sea. The position of Nazca became close to the modern one. Artesian springs have dried up, the hills ceased to shed water and Nazca began to turn into a desert. 2. The relief on the territory of the former plain became more contrast. Large depressions appeared. They became the containers of water. Areas with low hilly relief appeared. 3. The relief on the periphery of Nazca has undergone even greater changes. Some lines after rising above the plains by hundreds of meters were now at the height of 1 km or more. Others were on the side slopes with the angle of 30-40º. The examples of this are the areas between the Palpa and the Rio Grande rivers, the Palpa and the Viscas rivers, and the left bank of the Viscas river. 4. As a result of these events, after some time the area has changed beyond recognition. The desert formed in the place of flood plain did not allow to use it for farming, but instead some new areas appeared there suitable for this purpose − river valleys. During the growth of the Andes the sloping of the bottom of major depression began to increase, hence, their bogging decreased and the drainage of excess moisture improved. Only after that people left the hills and began to make their villages and fields in the valleys near the water. A new period in people’s life began and it continues even today. It is interesting that the principle of natural irrigation, which was used by ancient people and consists in laying channels where water automatically flows to the plot of land located on a lower level, is still used today. However, now they build ​​concrete pipers that start in rivers closer to the mountains, where they still have water, and proceed to the goal not in a straight line, as it used to be, but round the relief, that had formed, and slowly come down and deliver water to the plots that are tens of kilometers away. Sometimes with the help of these tunnels water is transported even to the valleys separated by mountains. Such pipers go from the Rio Grande valley to the Palpa valley. There are some tunnels in the valleys of the Ingenio and Acari, too.